It’s been a hectic couple of weeks, so (a week late) I’m posting my final notes on EURAM 2007. EURAM 2007 ended Saturday [May 21] and with it two tracks that solicited papers on open innovation. To complete our EURAM 2007 coverage, I’ve asked fellow OI blogger Vareska van de Vrande to publish her thoughts on the other track (#12), which she attended and co-chaired. I attended all but two sessions of the track “Managing Open Innovation through Online Communities” (#15). Although I’ve already blogged on some aspects, I wanted to provide an overall summary. Sebastian Späth of ETH Zürich has also blogged on the track. Open source communities. At least six papers fit this category, which is not surprising since the organizers are all open source researchers (as were the two keynote speakers). Online communities other than open source, mainly around consumer products, but also Wikipedia, and web logs. Depending on how you classify it, another 4-6 papers. User innovation (of the von Hippel sense), which included both the open source and other communities. The example that stood out was music mods but this seemed to be the one common innovation perspective through the majority of the papers. The keynotes turned out to be a nice complement to each other, one emphasizing open innovation and the other user innovation and online communities. My own keynote discussed how open innovation links directly to the open source phenomenon when companies are involved. But (except for the paper presented by Cristina Rossi) the connections of these papers to open innovation and the work of Henry Chesbrough were more implied than explicit. Of interests to readers of this blog, there certainly are research opportunities here to do more with open innovation. One of the criticisms of the open innovation paradigm (beginning with Chesbrough’s 2003 book) was that the examples were so heavily weighted towards IT that many questioned whether it generalized beyond IT. Last year’s special issue of R&D Management provided additional evidence for open innovation beyond IT. But the work in this conference on user innovation shows how more work can be done on consumer-centric user innovation — which, to the degree it provides innovation to a firm, also qualifies as open innovation. The other keynote came from one of the leading experts on user innovation — Karim Lakhani, former von Hippel student and now a Harvard b-school prof. His closing keynote (among other things) challenged us to study the innovation role of communities with more precision and depth. Are communities another organizational form? What holds them together? What do we gain from all the various theoretical lenses that have been used to study communities? As Lakhani alluded to in his slides (I couldn’t attend his talk), one problem with the papers and the field is that we sometimes use the term “innovation” too loosely. There is the old question of whether an open source re-implementation of existing software really qualifies as a technological innovation: Apache was breaking new ground from day one, but the impetus for Linux (and GNU) was to create a Unix knock-off with different IP rights. One of the track’s papers described a viral marketing effort as user innovation, although this could still be plausible if we consider that the innovation process includes interpreting and applying innovations, not just their design and production. Overall, the online communities track demonstrated the strength of a special interest track system, in that there were synergies (network effects :-) of having so much similar research and researchers in one room for 2 1/2 days rather than tiny pockets randomly scattered throughout a conference. The feedback for open source and user innovation research was exemplary, even if the open innovation knowledge in the room wasn’t nearly as strong (perhaps because they were all in track #12). Some of the papers are expected to be combined into a special issue of Industry and Innovation to be published in Spring 2008. More details later. The final event of the “Managing Open Innovation through Online Communities” track was a keynote by Karim Lakhani, integrating the entire track. I’m sorry I was unable to attend the keynote (when I made my train reservation, I didn’t know about the inflexibility of the HEC shuttle buses), but Karim was gracious enough to share his slides. I wish I had been able to go, because it’s clear that Lakhani tried to stir things up and the discussion must have been lively. Still, the ideas are well worth acknowledging in a blog about open innovation. One problem that Lakhani pointed out is that sociologists could never agree on what “community” is, with nearly 100 definitions used by 1955 and an ongoing split (identified in 1887 by Ferdinand Tönnies) between the two ideas expressed in German as Gemeinschaft (community) and Gesselschaft (society). The field also sought to reject any concept of community working together for utilitarian (rational choice) reasons. A community is an actor constellation that consists of individuals who perceive to have something in common with others, and whose actions and interactions are at least partially influenced by this perception. To this, he wonders how we can/should study communities in innovation. Are communities really like organizations? How are sponsored communities different from organic ones — or ones organized entirely within a firm? After examining communities, he sought to unpack the other words of the track title and the controversies that might be studied within each: open, innovation, managing, etc. I’m sure this was equally important, but I had trouble engaging this from the slides. And the community dimension is one that was particularly salient for me at EURAM, as I presented the latest version of my work with Siobhán O’Mahony on sponsored open source communities. When compiling an open innovation research agenda that concluded the 2006 book, I’m embarrassed to say that we didn’t even list “community” among the different levels of analysis that might be used — even though I’d co-authored an open source chapter in the same book and already presented a paper with Siobhán on sponsored communities. This was a major omission, because studying communities — particularly outside open source — seems a major opportunity for open innovation scholars. In my book chapter with Scott Gallagher analyzing open source as an example of open innovation, we were challenged two years ago by co-editor Henry Chesbrough to more clearly delineate the overlap between the two constructs — including examples of IT innovations that fit in one category but not the other. It turns out that the resulting typology — Figure 5.1 in our 2006 book — has well stood the test of time. I used it again this week in my keynote speech at EURAM, in this case to introduce open source researchers to open innovation concepts. However, one thing bothered Scott and me. We were very interested in game mods as something that was definitely open innovation, but (except in rare cases) did not really use the open source IP model. We were not sure whether it was representative of a broader phenomenon or just an interesting anomaly. There is so much about the video game industry that is anomoulous — despite the industry’s huge economic significance — that we thought this could be just one more. It turns out there’s an N of at least 2, because music mods seem to work almost the same way as game mods. I learned about this from two papers at the EURAM 2007 online communities track. This research has been pioneered by Lars Bo Jeppesen, although the 2nd paper (by Linus Dahlander and Lars Frederiksen) did not involve “Lars Bo” (as everyone called him this week). The company involved in this is called Propellerhead Software of Sweden. Even if the name is not familiar to readers, anyone who’s walked into a guitar store (such as Guitar Center) in the US has seen their Reason software, providing a software-only simulation of all the great guitars and amplifiers during the seminal rock & roll era of the 1960s and 1970s — sounds originally created using wirewrap components, discrete components, or even tubes. Propellerhead has an active community of user-contributed content — special sounds and sound effects. Jeppesen said that a typical computer-controlled musical instrument would take 100-150 hours to develop by an experienced Propellerhead engineer. They have attracted free some 100 significant modifications by users. Of course, this is exactly the user innovation paradigm of Eric von Hippel of MIT. Jeppesen and Frederiksen already published a 2006 paper on this in Organization Science (DOI: 10.1287/orsc.1050.0156). I had previously read parts of the article, but somehow never made the connection between their research and the demo I saw of Reason and the Line 6 Toneport at the Guitar Center booth during the 2006 and 2007 Macworld Expo. On Thursday morning, I kicked off the track with a keynote linking open innovation and open source software. My slides will be (now are) available online. As I found out, most of the audience was familiar with the original Chesbrough book Open Innovation, but were not using the concepts in their research. This is an issue I’ve encountered before. Some of it is because Chesbrough’s choice of terminology is oh descriptive and generic — adding “open” as a modifier to “innovation” can and has been used by other researchers in a sense not consistent with Henry Chesbrough’s definition. In other cases, there is an attempt to piggyback on the recent popularity of the buzzword in industry and academia. So I want to highlight one small part of my talk — that which contrasts the innovation models of Chandler, Chesbrough, Scotchmer and von Hippel. Alfred Dupont Chandler, Jr. is America’s greatest business historians, the one primarily responsible over the past 40 years for our understanding of how and why the modern American (and later, multinational) corporation developed. In books such as the The Visible Hand (1977) and Scale and Scope (1990), he showed how companies of the late 19th century and early 20th century diversified and integrated to command dominant positions in their respective markets. Most of the companies he selected had significant administrative (organizational) innovations that helped define our modern conception of how to build a large corporation. While railroads or Sears Roebuck did not have a significant product innovation effort, it was impossible to write about the US (or German) chemical industry without considering the role of the internal industrial R&D lab in the success of the large firm. Such vertical integration of R&D to product development and distribution is the exact opposite of what the original Open Innovation book was attacking. It’s not that open innovators (such as IBM) can’t have in-house R&D, but their innovation strategies should not be defined only in terms of progressing internal technologies to internal investigations to a firms own R&D funnel. Over and over again, I illustrate this using Figures 1.1 and 1.1 from Chapter 1 (by Chesbrough) of our 2006 book. But open innovation overlaps heavily with two other streams of research on innovation. Researchers on each side often omit the links, either because they don’t know them, because they are emotionally or intellectually invested in one paradigm, or (legitimately) for parsimony or compactness. Still, both paradigms have strong links back to open innovation. 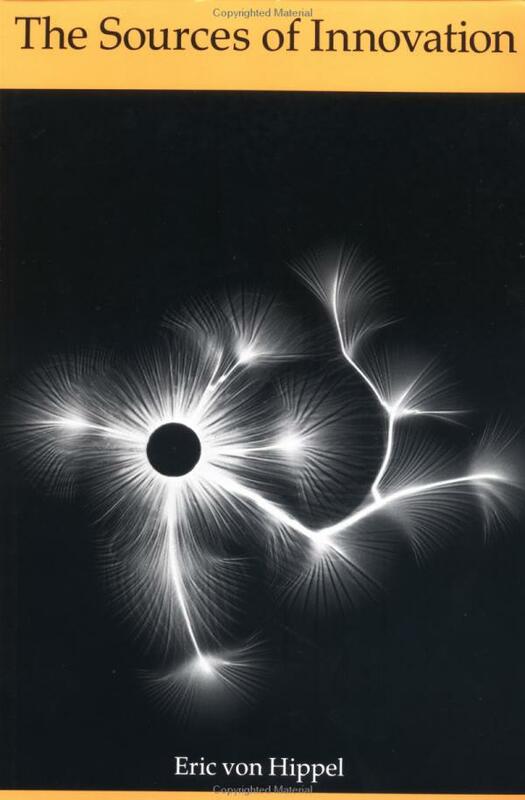 The better known of the two is the user innovation paradigm of MIT’s Eric von Hippel. Promulgated with his 1988 book (Sources of Innovation) and a series of journal articles, von Hippel focused on the idea that firms could tap into both the knowledge and desire of users to solve their own needs. In some cases, it’s a classic win-win, as users get a better solution and producers gain a broader (or deeper) solution to sell. The user innovation paradigm is the theoretical basis for a large stream of open source software research (particularly from Karim Lakhani), as it is an excellent fit to the entire Apache experience. (As far as I know, the only research that interprets OSS through open innovation paradigm is my own work with Scott Gallagher). 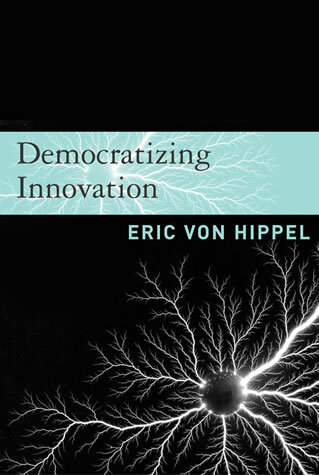 Von Hippel has combined his earlier work, the open source work, and other evidence along the way in his 2005 book Democratizing Innovation. The other stream is the concept of cumulative innovation. Some of this ties back to the cumulative processes of public science (analyzed, by among others, Paul David). But perhaps the most single-minded pursuit of the topic has been by Suzanne Scotchmer, both in her 2004 book and in various papers. † In my original slides, I limited von Hippel to user innovation, but my audience reminded me that his 1988 book also included supplier innovation — which has been de-emphasized in subsequent work by von Hippel and his followers. Chesbrough’s 2003 book certainly acknowledges the influence of von Hippel’s earlier book. Our 2006 book acknolwedges both books — although the mention of the later book is cursory only because it came out about the same time as we sent our manuscript to Oxford (October 2005). Conversely, many of the current user innovation researchers have a potential open innovation angle if they chose to pursue it. So far, I’m not aware of anything that links Chesbrough to Scotchmer — perhaps because one is management and one is economics, or perhaps because the former favors strong IP rights and the latter is more about weakening (at least slightly) IP protection. Right now, I don’t know how I’m going to pursue this comparison, but it seemed useful to my fellow researchers attending the conference and the track. Update: Ironically, as I was preparing to come to Europe, Al Chandler died at the age of 88. But the Chandlerian approach towards understanding large firms will long survive him.